After thinking this out and reading up around the net. My super modular mini mac travel the globe with it all in a well organized carry on roller back pack setup. Fast internet hub 300 g.
Maybe one da a mini modular a patchbay wired to the guts of some modules say a two rack space with af few pots. and a built in fire audio to DC interface. The idea is to have the most amount of functionality in the ligthest package. Small is good when travelling, underpowered plugs are bad when performing this setup solves both problems. No I mean Yes? Last edited by TwoToneshuzz; 10-02-2011 at 11:36 PM. 3 mac minis? not that i'm not all for the nerdery but what do you need those for? that's a lot of power. are you performing with band and need all kinds of sample libraries and stuff? is this a redundancy factor or something? just curious what you're using all that for. I've been using Numerology now for 22 months. Using it until I get bloody knuckles using it so that when I see stary night skies I think to myself that I'd like to patch all those stars up together so I could hear how they'd sound.. when modulated by a GALACTIC sized super lfo..
No it's not too much power. I'm the happy owner of all those plugs I've mentioned but some of them are so open ended that ONE patch, in ACE or Tassman, or NI's Razor or Filterscape , as well as some reverbs could take 40 percent, of my present computers capacity. Or effects chains. 8 units long and with three parallel streams. Thats twenty four effects in a mega chain. One Mac mini might be able to handle this. Or heavy sample instruments like the True Strike tension x10. Would use all three mac minis..
And this is the kicker as the developers think up new crazy things, Like Urs Heckmans Bazille. And if there ever comes a Tassman 5 .. things are only going to get worse. Anyways it's a common thing to want more power than one box can deliver for visionary uses of compuer tech. So open ended systems= CREATIVITY, how can you optmize your setup if you don't make an all stops pulled Prototype first..Then you can optimize you know the path to take what's redundant then you might beable to pair your 24 unit effects chain down to 10, or think up ways to dynamically load and unload plugs as you are playing. Effects processors played like it's in a sample instrument that gets loaded fires off it's output and then unloaded again..
You don't know if this Monster prototype these crazy ideas are worth optmizing if you haven't spent time working with it. Tassman is 7 years old. There are some patches intruments made for it five years ago, that still take more than 30% of the CPU power on my computer. But the sound from these monster patches is like looking into a totally multilayered irridescent 3 dimentional lattice work.. The physical modelling engins in the patches makes this three dimensionality possible.. I must say that the AAS stuff for me is still the most enjoyable to work with for long periods of time, less aural fatigue, there's no aliasing with this physical modelling. I repeats Quality = Less stress on the ears. In performance mode, if I'd don't need all the power one computer could be set to graphic files playback. Finally if I had this setup and showed up a a small music school, I could have everything primed and ready for teaching a class in Modular Sequencing..
Last edited by TwoToneshuzz; 10-03-2011 at 03:56 AM. I'd bump the macbook air up to a pro -- 15" if you can handle it. The latest air's are pretty good (and much better than the 1st gen), but not nearly as fast as the pro line of macbooks. i'm all for 'more power'. i was just curious what your needs/plans are. i have a quad intel from 2009 and a new macbook pro that is also a quad and it's amazing how much faster they are. 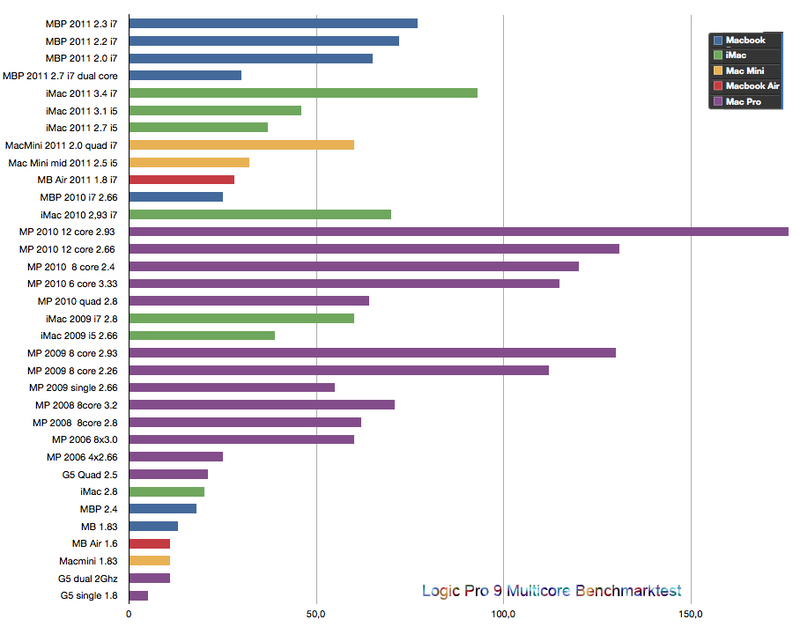 my intel 2.8 2008 laptop could muster about 21 tracks in logic on the benchmark test. my 2009 quad intel does like 70.. my new macbook pro also does about 70. it's crazy how fast they are. so, 3 quad mac minis is gonna be a little beast of a set up. you'll get a lot of juice out of it. I'm just looking at the weight optimization. But the CPU is definitly somehwat underpowered. Another problem is the small screen. So Likely a 15 inch would be the most comforables size if you were doing serious working on projects routing and such.. Thanks for the heads up. I be getting the mac mini. before the macbook. February or there abouts.. This is a modular setup so maybe I'll find I can do with one additional Computer and just stop there. But what the hey it's what I love doing so it's no problem to use a little more on equipment to make my time spent more productive.. Building these things up over a 4 or 5 year timespan make it easy to do without breaking the bank.. Now about two years ago I had not much gear.. So i figure in another two years I'll have this nicely rounded out. Very informative. I have a hard time getting the specs and the real life performance to become a known.. I should mention here that I'm working only in Numerology. I find keeping the number of programs I need to learn to a minimum a very important part of maintaning the fun factor.. A program becomes with intensive daily use becomes almost like a living enviroment a type of cosmos, when you really go into depth with it. Sure threre is performance gains to be had using Logic. But with a few dollars extra I can have things they way i like it. And perhaps discover some things that I would have missed had I spent time on another program. But it's quite interesting to see how great the quad mac mini is performing..
With a SSD drive it it could be enough. I basically eventual want to kill off the imacs I find these things over decided.. I liked to have the 3 imacs hooked up to high end screen that can rotate into portrait orientation, great for numerology also great for my increasingly neglected photography.. Thanks again for the advice..
Last edited by TwoToneshuzz; 10-03-2011 at 03:08 PM. i wasn't pushing logic on you.. just showing the differences in CPU performance from the various models and logic just happened to be the app they used. Actually I already have logic, it's a nice program for sure. I'm just the guy that has a lot of different types of creative moduses, Piano playing, Photography, Gardening. I can get away with being diversified if I focus when I'm working on each area. I also have a long history of working in the above mentioned areas. So it's only natural it seems to me to try a few different approaches to try to make sense of this thing called lifetime and lifetime learning..
No offence taken I didn't feel you were "pushing" anything on me.. They also have these nifty racks for minis. It seems like weight may be an issue, but getting it all into a rack case might be a good idea.